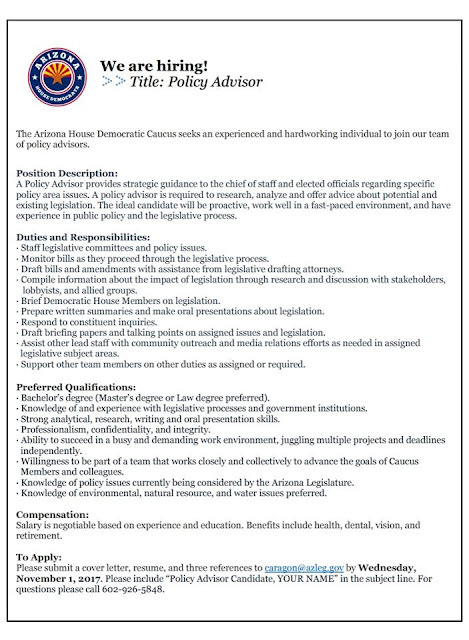 The House Democratic Staff is hiring an experienced and motivated individual to join our team as a Policy Advisor. Please share the job announcement with your networks. The full job posting is attached or can be viewed at https://www.azhouse.gov/career-opportunities/. Specific policy experience in the areas of environment, water and natural resources is preferred but not required. Resumes must be submitted to Cynthia Aragon at caragon@azleg.gov by November 1, 2017.